These events are not the fanciful dreams of futuristic sci-fi film directors, but are real changes that have been brought about in laboratories over the past five years. Scientists have been investigating the properties of certain cells in many adult organs, and found that these so-called stem cells have the remarkable property of "plasticity". This means that they can change from being one sort of cell (such as a nerve cell) to being another type (such as an immunological blood cell) after being treated in special ways. But we know that in real life our livers don't suddenly dissolve into our bones, and that our brains don't liquefy into blood, so what's the deal here? This research is so important because stem cells from adult organs could be of major therapeutic use in treating diseases such as leukaemia, Parkinson's and many others. 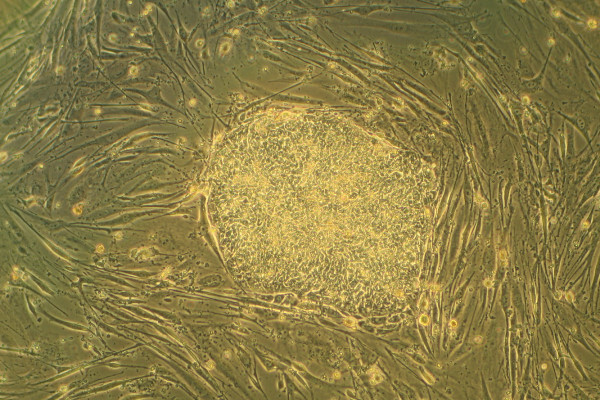 Stem cells could be changed ("differentiated") into the cell type that is damaged in that particular disease, then transplanted into the affected area. However, if the stem cells come from a different person or animal to the one they are to be transplanted into, immune rejection may occur. Obtaining stem cells is also a problem. You may have heard of embryonic stem cells, which can be made from embryos only a few days old. Another potent source of stem cells is the developing foetus. Yet it is difficult to derive these cells from humans, both technically and ethically. An easily obtainable source of stem cells taken from adult organs would therefore be an immense boon, as they could be taken from any unaffected organ in the patient, differentiated into the new cell type, then returned. A recent paper published by a group of scientists at the University of Durham (UK) demonstrated an intriguing new source of stem cells- your hair! The researchers took hair follicles from rats and mice, and grew them in culture under special conditions. Almost unbelievably, the follicle cells began to change into myeloid blood cells- the type that form the white cells in the immune system. Even more exciting was the discovery that these cultured cells could then be transplanted into animals which had all their myeloid cells removed by radiotherapy. The transplanted cells were capable of replacing all the missing components of the immune system, an effect which lasted for over a year. Thinking therapeutically, this could be of immense use in treating blood disorders such as leukaemia, in which the white blood cells multiply out of control. Often it is treated by using radiotherapy to kill all the patient's rogue cells, then performing a bone marrow transplant using tissue from a relative or similar donor. But there can be serious compatibility problems between the donor and patient due to the different genetic makeup of the two people. Using the patient's own hair cells would remove these problems, providing a pool of genetically identical stem cells. Perhaps in the future hair cells could be persuaded to adopt other fates, such as becoming nerves- these could be transplanted to reverse the effects of neurodegenerative diseases like Parkinson's. This is all very exciting, but what's the catch? Unfortunately adult stem cells are somewhat limited in the cell types they can become. This is mainly because they have already made several choices about what they are going to be, unlike embryonic stem cells, meaning that it is harder to reverse those decisions and adopt a different fate. Researchers are currently directing their attention to how cells make those choices, how they remember them, and how we can reverse them. This work will hopefully open the door to new therapies for what are currently incurable diseases.